Rowing is one of the best total-body workouts possible. It tones muscles, improves cardiovascular health, and offers a challenging workout. When you need rowing equipment that will last far into the future and fit your budget, California Spa & Fitness has the options you’re looking for. We provide a huge variety of the highest quality rowing machines available, with options for all fitness levels from beginner to advanced. The products we sell are durable, stylish, and come with exceptional warranties. We also offer many award-winning rowing machines, some of which have been modeled after Olympic training machines. If you are new to rowing and aren’t sure which machine is right for you, our friendly, knowledgeable staff will offer personalized service so you can make the right choice of fitness equipment. Visit us today or click below to see our full selection of rowing machines. Many people choose to purchase a rowing machine as they are famous for providing one of the best full-body workouts available within the comfort of your own home. They operate your upper body, lower body and complete core with one fluid motion. With constant use, rowing stipulates a number of health benefits< including muscle building, weight reduction, stress reduction and increased body strength. With a wide variety of rowers available to select from, selecting the model which will best suit your space requirements, in addition to lifestyle and exercise objectives, can substantially depend on the size of this machine and sort of resistance that it uses. Virtually silent, the magnetic resistance rowing machine is perfect for home fitness as it provides a smooth rowing stroke, with no noise as the machine uses a magnetic brake system instead of wind resistance, which produces friction and some degree of sound. Models may have an entirely magnetic resistance system or be a hybrid of magnetic and air resistance. Water resistance models are designed for individuals that participate or compete in outdoor rowing. The water flywheel realistically simulates the feel of rowing on the water. These models are still almost completely silent with the exception of a slight swishing sound of the water while in use. These models are an optimal solution if space is a concern and are also very economical. Hydraulic rowers receive varying degrees of tension from the amount of either air or fluid that is compressed within the machines piston or cylinder. The physical motion that is used with hydraulic models also differs from flywheel, magnetic or water rowing machines. Hydraulic rowers require more of an exercise position and body movement versus a natural rowing motion with synchronized arm and leg movements. Flywheel rowing machines feature air-based resistance and do feel similar to rowing outdoors with their smooth and natural rowing stroke.They are wind-based and activated with a pulling motion that spins the internal flywheel and fan blades. The resistance can be adjusted by pulling harder which moves the flywheel faster, creating a greater wind resistance and a more challenging workout. Some rowers are noisier than others. Magnetic models are virtually silent while hydraulic, water and flywheel machines have varying degrees of sound. Not all people prefer a silent rower as some enjoy the sound while exercising or feel that it provides a more realistic experience. Make sure that the indoor rower that you select has some degree of adjustability, a comfortable seat, and quality foot pads. As rowers do not have as many moving parts as other exercise machines, they can handle a higher weight capacity. Most quality rowing machines are equipped with a monitor that displays time, distance and the number of calories burned. Some models have options to connect personal fitness apps to upload your data and track progress. The ability to easily store your rowing machine is a huge feature for many individuals. Research if the machine can fold up or come apart easily to be stored and if it has wheels to make it simple to move. 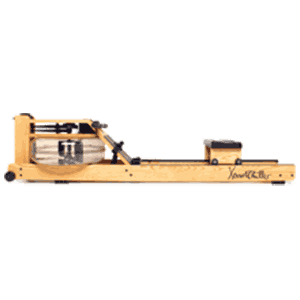 There is a wide range of prices for indoor rowers starting at economical entry-level models to high-end machines. Higher priced models are designed to handle heavy usage and will last longer, whereas a budget model can provide a great workout but may require maintenance or replacement quicker. Although you may only have to assemble the machine once, some models are more difficult than others. Investigate the ease of assembly before purchasing to save yourself from a frustrating experience. 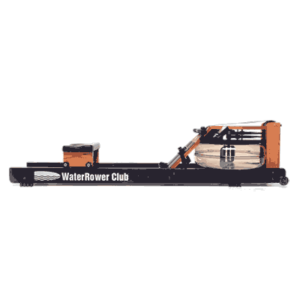 Research what type of warranty is provided with your indoor rower and make sure that it covers the frame and parts. Always carefully measure the space where you will be placing your rowing machine. Sizes can vary greatly amongst models and when selecting one, make sure that you check the dimensions of the rowing machine to ensure that it will fit well within your home. In addition to size, the weight of rowers can have a vast range starting from just over 30 pounds with foldable space saving features to being well over 100 pounds. The resistance of a rowing machine is what affects how the rowing mechanism moves. You should choose a resistance method that will suit your lifestyle and budget requirements as well as your overall fitness goals. Both magnetic and hydraulic models are excellent for those seeking a full body workout, but not to train for the sport of rowing. For those that are competitive rowers, water-resistant machines provide a realistic feel and experience.